We have studied two specific issues related to image compression, i.e.., region-of-interest (ROI) coding and image post-processing. Specifically, we proposed a new JPEG2000 compliant ROI coding method that is called Partial Significant Bit-plane shift (PSBShift). We also investigated how to improve image quality both subjectively and objectively by effective post-processing. ROI coding example of the Barbara image. 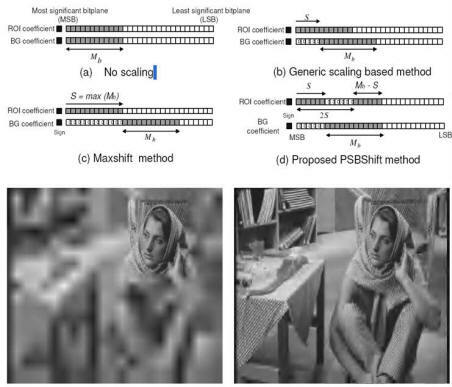 L. Liu and G. Fan, “A New JPEG2000 Compliant Region-of-Interest Image Coding Method: Partial Significant Bitplanes Shift”, IEEE Signal Processing Letters, Vol. 10, No. 2, pp35-38, Feb. 2003. G. Fan and W. K. Cham, “Post-processing of Low Bit-rate Wavelet-based Image Coding Using Multiscale Edge Characterization,” IEEE Trans. 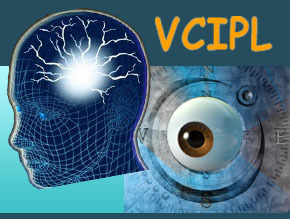 on Circuits and Systems for Video Technology, Vol. 11, No. 12, pp1263 -1272, Dec. 2001. G. Fan and W. K. Cham, “Model-Based Edge Reconstruction for Low Bit-rate Wavelet Compressed Images,” IEEE Trans. on Circuits and Systems for Video Tech., Vol. 10, No. 1, 2000, pp120-132. G. L. Fan and W. K. Cham, "Post-processing for Low Bit-rate Wavelet-based Image Coding Using Multiscale Edge Characterization", in Proc. of the IEEE Data Compression Conference (DCC98), Snowbird, UT, 1998, p545. G. L. Fan, W. K. Cham and J. Z. Liu, "Model-Based Edge Reconstruction for Low Bit-rate Wavelet Image Coding", in Proc. of the IEEE International Conference on Acoustics, Speech and Signal Processing (ICASSP98), Seattle, WA, 1998, p2561-2564. G. L. Fan and W. K. Cham, "Multiscale Image Reconstruction for Low Bit-Rate Wavelet Image Coding", in Proc. of the 1998 IEEE International Conference on Image Processing (ICIP98), Chicago, IL, Oct. 1998, p420-424. G. Fan and L. Zhou, "Visual Entropy -based Classified Bath Fractal Transform for Image Coding", in Proc. of the IEEE International Conference on Signal Processing (ICSP1996), Oct., 1996, Beijing, China.